Backing beans (@ManagedBean) or CDI Beans (@Named)? It is a historical accident that there are two separate mechanisms, CDI beans and JSF managed beans, for beans that can be used in JSF pages. We suggest that you use CDI beans unless your application must work on a plain servlet runner such as Tomcat. Why? They don't provide any justification. I've been using @ManagedBean for all the beans in a prototype application running on GlassFish 3, and I haven't really noticed any issues with this. I don't especially mind migrating from @ManagedBean to @Named, but I want to know why I should bother. CDI is preferred over plain JSF because CDI allows for JavaEE-wide dependency injection. You can also inject POJOs and let them be managed. With JSF you can only inject a subset of what you can with CDI. As per JSF 2.3, @ManagedBean is deprecated. See also spec issue 1417. This means that there's not anymore a reason to choose @ManagedBean over @Named. This was first implemented in Mojarra 2.3.0 beta version m06. The core difference is, @ManagedBean is managed by JSF framework and is only via @ManagedProperty available to another JSF managed beans. @Named is managed by application server (the container) via CDI framework and is via @Inject available to any kind of a container managed artifact like @WebListener, @WebFilter, @WebServlet, @Path, @Stateless, etc and even a JSF @ManagedBean. From the other side on, @ManagedProperty does not work inside a @Named or any other container managed artifact. It works really only inside @ManagedBean. Another difference is that CDI actually injects proxies delegating to the current instance in the target scope on a per-request/thread basis (like as how EJBs are been injected). This mechanism allows injecting a bean of a narrower scope in a bean of a broader scope, which isn't possible with JSF @ManagedProperty. JSF "injects" here the physical instance directly by invoking a setter (that's also exactly why a setter is required, while that is not required with @Inject). While not directly a disadvantage — there are other ways — the scope of @ManagedBean is simply limited. From the other perspective, if you don't want to expose "too much" for @Inject, you can also just keep your managed beans @ManagedBean. It's like protected versus public. But that doesn't really count. At least, in JSF 2.0/2.1, the major disadvantage of managing JSF backing beans by CDI is that there's no CDI equivalent of @ViewScoped. The @ConversationScoped comes close, but still requires manually starting and stopping and it appends an ugly cid request parameter to outcome URLs. MyFaces CODI makes it easier by fully transparently bridging JSF's javax.faces.bean.ViewScoped to CDI so you can just do @Named @ViewScoped, however that appends an ugly windowId request parameter to outcome URLs, also on plain vanilla page-to-page navigation. OmniFaces solves this all with a true CDI @ViewScoped which really ties the bean's scope to JSF view state instead of to an arbitrary request parameter. JSF 2.2 (which is released 3 years after this question/answer) offers a new fully CDI compatible @ViewScoped annotation out the box in flavor of javax.faces.view.ViewScoped. JSF 2.2 even comes along with a CDI-only @FlowScoped which doesn't have a @ManagedBean equivalent, hereby pushing JSF users towards CDI. The expectation is that @ManagedBean and friends will be deprecated as per Java EE 8. If you're currently still using @ManagedBean, it's therefore strongly recommend to switch to CDI to be prepared for future upgrade paths. CDI is readily available in Java EE Web Profile compatible containers, such as WildFly, TomEE and GlassFish. 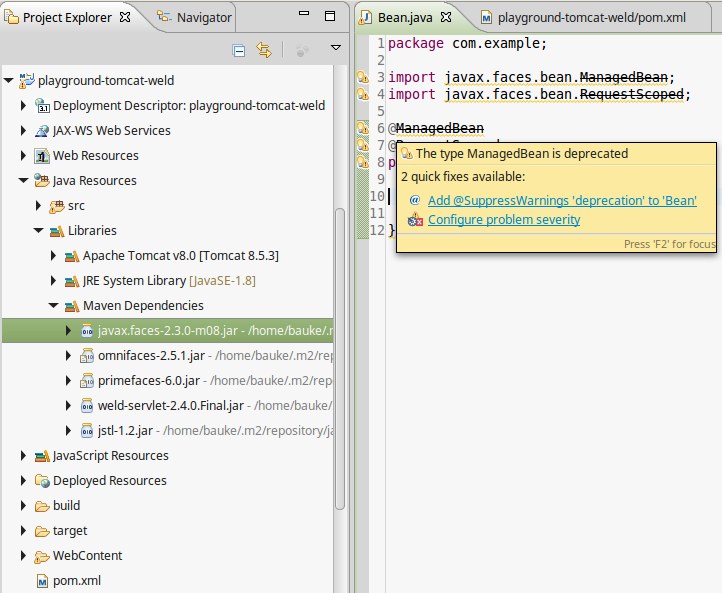 For Tomcat, you have to install it separately, exactly as you already did for JSF. See also How to install CDI in Tomcat? @javax.faces.bean.ManagedBean is refer to JSR 314 and was introduced with JSF 2.0. The main goal was to avoid the configuration in the faces-config.xml file to use the bean inside an JSF Page. @javax.inject.Named(“myBean”) are almost the same, as that one above, except you need a beans.xml file in the web/WEB-INF Folder to activate CDI. I was using CDI in GlassFish 3.0.1, but to get it to work I had to import the Seam 3 framework (Weld). That worked pretty well. In GlassFish 3.1 CDI stopped working, and the Seam Weld stopped working with it. I opened a bug on this but haven't seen it fixed yet. I had to convert all my code to using the javax.faces. * annotations but I plan to move back to CDI once they get it working. I agree you should use CDI, but one issue that I haven't seen resolved yet is what to do with the @ViewScoped annotation. I have a lot of code that depends on it. It is not clear whether @ViewScoped works if you are not using @ManagedBean with it. If anyone can clarify this I would appreciate it. One good reason to move to CDI: you could have a common session-scoped resource (user profile for example) @Inject'ed into both JSF managed beans and REST services (i.e., Jersey/JAX-RS). On the other hand, @ViewScoped is a compelling reason to stick with JSF @ManagedBean - especially for anything with significant AJAX. There is no standard replacement for this in CDI. Seems that it may have some support for a @ViewScoped-like annotation for CDI beans, but I haven't played with it personally. Not the answer you're looking for? Browse other questions tagged jsf java-ee jsf-2 cdi or ask your own question. Are @ManagedBeans obsolete in JavaEE6 because of @Named in CDI/Weld? JSF2 : inject service objects to managedbean from Spring? Why is my Glassfish3.1.2.2/MyFaces2.1.9/JSF-managed performing better than TomEE1.5+/CDI-managed? Does Spring Framework come with its own beans?